Follow a healthy diet plan. Get vaccinations for influenza, hepatitis A and B, and pneumococcal pneumonia (if recommended by your doctor). Inform your health care provider of all prescription and nonprescription medications, and any herbs and supplements, you take or are considering taking. Cirrhosis is considered an irreversible condition. Treatment focuses on slowing the progression of liver damage and reducing the risk of further complications. Your doctor will treat any underlying medical conditions that are the cause of your cirrhosis. If liver damage progresses to liver failure, some people may be candidates for liver transplantation. Liver donations can come from either a cadaver or from a living donor. People with cirrhosis who have a liver transplant have very good chances for survival. Cirrhosis is scarring of the liver and poor liver function. It results from various disorders that damage liver cells over time. Eventually, damage becomes so extensive that the normal structure of the liver is distorted and its function is impaired. Cirrhosis is the end result of long-term liver damage. Alcohol abuse, and chronic hepatitis B and C, are the leading causes of cirrhosis.
. As the scarring becomes more severe and extensive, cirrhosis occurs. The small blood vessels and bile ducts in the liver narrow (constrict). Blood vessels in other organs, including the kidney, also narrow. Blood flow coming from the intestine into the liver is slowed by the narrow blood vessels. It backs up through the portal vein and seeks other routes. form in the stomach and lower part of the esophagus to transport the blood diverted from the liver. , a yellowish discoloration of the skin and eyes, as well as dark-colored urine. The liver is the largest internal organ in the body. In a healthy adult, it weighs about 3 pounds. The liver is wedge-shaped, with the top part wider than the bottom. It is located below the diaphragm and occupies the entire upper right side of the abdomen. The liver processes (metabolizes) and stores all of the nutrients the body requires, including sugars, fats, minerals (iron and copper) and vitamins. The liver is the body's "factory" where many important proteins, such as albumin, are made. The liver also produces essential proteins for blood clotting. , which is important in digestion. 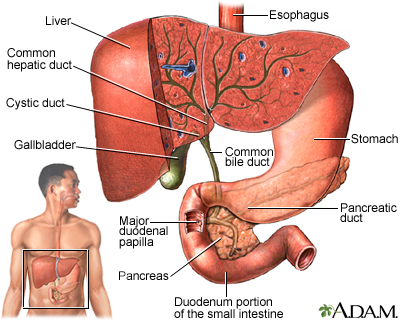 Bile is a green-colored fluid that helps the body absorb fats and fat-soluble vitamins. Bile contains bilirubin, a yellow-brown pigment produced from the breakdown of hemoglobin, the oxygen-carrying component in red blood cells. An important job of the liver is to make toxic substances in the body harmless. These include substances made by the body (such as ammonia and by-products of digestion) and substances you may ingest (such as alcohol and drugs). Chronic alcohol abuse causes alcoholic liver disease (also called alcohol-induced liver disease). Alcoholic liver disease includes fatty liver (build-up of fat cells in the liver), alcoholic hepatitis (inflammation of the liver caused by heavy drinking), and alcoholic cirrhosis. In the liver, alcohol converts to toxic chemicals that trigger inflammation and tissue injury. This process can lead to cirrhosis. Chronic viral hepatitis, both hepatitis B and hepatitis C, is another major cause of cirrhosis. Chronic hepatitis C is a more common cause of cirrhosis in developed countries, while hepatitis B is a more common cause of cirrhosis worldwide, especially in sub-Saharan Africa and parts of Asia. People with chronic hepatitis B who are co-infected with hepatitis D are especially at risk for cirrhosis. The longer a person has chronic hepatitis, the greater the risk for eventually developing cirrhosis. Hepatitis viruses produce inflammation in liver cells, causing injury or destruction. If the condition is severe and long-term, the cell damage becomes progressive, leading to severe scarring of the liver. Hepatitis C is a virus-caused liver inflammation which may lead to cirrhosis. The people most at risk for contracting and spreading hepatitis C are those who share needles for injecting drugs. Autoimmune hepatitis, like other autoimmune disorders, develops when a misdirected immune system attacks the body's own cells and organs. People who have autoimmune hepatitis also often have other autoimmune conditions, including systemic lupus erythematosus, rheumatoid arthritis, Sjögren syndrome, scleroderma, inflammatory bowel disease, glomerulonephritis, and hemolytic anemia. Autoimmune hepatitis typically occurs in women ages 15 to 40. Disorders that block or damage the bile ducts can cause bile to back up in the liver, leading to inflammation and cirrhosis. These diseases include primary biliary cirrhosis and primary sclerosing chlorangitis. Up to 95% of primary biliary cirrhosis (PBC) cases occur in women, usually around age 50. In people with PBC, the immune system attacks and destroys cells in the liver's bile ducts. Like many autoimmune disorders, the causes of PBC are unknown. Primary sclerosing cholangitis (PSC) is a chronic disease that mostly affects men, usually around age 40. The cause is unknown, but immune system defects, genetics, and infections may play a role. Most patient with PSC also have inflammatory bowel disease. Nonalcoholic fatty liver disease (NAFLD) resembles alcoholic liver disease, but it occurs in people who do not drink a lot of alcohol. NAFLD is the most common liver disease in the United States. is the earliest stage of NAFLD. It is marked by the presence of fat in the liver (steatosis), but liver damage has not occurred. While a fatty liver is not normal, NAFL is not considered a serious condition. is the next stage of NAFLD. NASH is characterized by liver inflammation and injury, as well as a fatty liver. NASH is dangerous because it can lead to the scarring of the liver associated with cirrhosis. NASH is one of the leading causes of cirrhosis. is the final irreversible stage of NAFLD. Nonalcoholic fatty liver disease is usually benign and very slowly progressive. But, in certain people, it can lead to cirrhosis and eventual liver failure. NAFLD also increases the risk for heart disease, which is the leading cause of death for these people. Hemochromatosis is a disorder of iron metabolism. This disease interferes with the way the body normally handles iron. People with hemochromatosis absorb too much iron from the food they eat. The iron overload accumulates in organs in the body. When excess iron deposits accumulate in the liver, they can cause cirrhosis. Other inherited diseases that can cause cirrhosis include Wilson disease (which causes an accumulation of copper in the body), alpha-1 antitrypsin deficiency (a genetic disorder caused by defective production of a particular enzyme), and glycogen storage diseases (a group of disorders that cause abnormal amounts of glycogen to be stored in the liver). Schistosomiasis, a disease caused by a parasite found in the Asia, Africa, and South America. Long-term or high-level exposure to certain chemicals and drugs, including arsenic, methotrexate, toxic doses of vitamin A, and certain prescription medications. Means that the body still functions fairly well despite scarring of the liver. Many people with compensated cirrhosis experience few or no symptoms. Means that the severe scarring of the liver has damaged and disrupted essential body functions. People with decompensated cirrhosis develop many serious and life-threatening symptoms and complications. Spider angiomas may develop on the skin. These are pinhead-sized red spots from which tiny blood vessels radiate. Some of these symptoms can lead to serious complications. Jaundice is a condition produced when excess amounts of bilirubin circulating in the bloodstream dissolve in the layer of fat underneath the skin), causing a yellowish appearance of the skin and the whites of the eyes. A damaged liver affects almost every bodily process, including the functions of the digestive, hormonal, and circulatory systems. Decompensated cirrhosis increases the risk of serious and potentially life-threatening complications. The most serious complications of cirrhosis are those associated with portal hypertension. The portal vein carries blood from the intestine to the liver. High pressure in the portal vein develops when scarring in the liver blocks this flow of blood. This condition is called portal hypertension. Portal hypertension causes some of the most serious complications of cirrhosis. Ascites, bleeding varices, hepatitis encephalopathy, and enlarged spleen are all associated with portal hypertension. If fluid accumulates in the lungs, it can cause problems with breathing. Although ascites itself is not fatal, it can lead to other more serious problems. is a complication of ascites. It is a life-threatening bacterial infection of the membrane that lines the abdomen. Symptoms include confusion and altered mental status, fever, chills, and abdominal pain. Certain medications, such as proton pump inhibitors (used for treating acid reflux and gastroesophageal reflux disease), may increase the risk for spontaneous bacterial peritonitis in people with cirrhosis. Ascites and portal hypertension can also cause kidney function to rapidly deteriorate. Portal hypertension causes the development of varices, veins that enlarge to provide an alternative pathway for blood diverted from the liver. Varices usually form in the esophagus. They can also form in the upper stomach. Varices pose a high risk for rupture and bleeding because they are thin-walled, twisted, and subject to high pressure. When varices rupture and bleed they can cause intestinal bleeding, a life-threatening event marked by black, tarry, or bloody stools or the vomiting of blood. Portal hypertension can affect blood flow in the spleen causing it to become enlarged (splenomegaly). When the spleen cannot function properly, levels of blood platelets and white blood cells are reduced. These blood problems increase risks for infection and excessive bleeding. Hepatic encephalopathy is impaired brain function due to liver damage. It is caused by a buildup of harmful intestinal toxins in the blood, particularly ammonia, which then accumulate in the brain. Early symptoms of hepatic encephalopathy include confusion, forgetfulness, and trouble concentrating. Other symptoms may include fruity-smelling bad breath and tremor. In late stages, hepatic encephalopathy can result in coma. People with cirrhosis have an increased risk for hepatocellular carcinoma, a type of liver cancer. Hepatitis B and C, alcoholism, hemochromatosis, and primary biliary cirrhosis, which are all causes of cirrhosis, are some of the major risk factors for liver cancer. Cirrhosis due to hepatitis C is the leading cause of hepatocellular carcinoma in the United States. 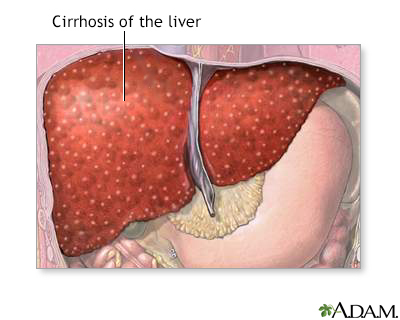 Cirrhosis is diagnosed on the basis of physical exam, medical history, blood tests, and imaging tests. A liver biopsy may be performed to confirm a diagnosis of cirrhosis. How the liver feels. The liver is often enlarged in early stages of cirrhosis. If the abdomen is swollen. The doctor will check for signs of fluid (ascites) by tapping the flanks and listening for a dull thud, and feeling the abdomen for a shifting wave of fluid. Other signs of cirrhosis such as jaundice, muscle wasting, mental status, and (in male patients) breast enlargement. A medical history will indicate risk factors for cirrhosis. People with a history of alcoholism, hepatitis B or C, or certain other medical conditions are at high risk. , including aspartate (AST) and alanine (ALT), are released when the liver is damaged. Albumin is a protein made in the liver. Serum albumin measures the amount of this protein in the blood (low levels indicate poor liver function). High ALP levels can indicate bile duct blockage. 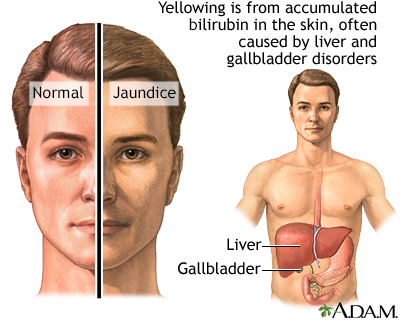 Bilirubin, a red-yellow pigment that is normally metabolized in the liver and then excreted in the bile. A damaged liver cannot process bilirubin, and blood levels of this substance rise. The PT test measures in seconds the time it takes for blood clots to form (the longer it takes the greater the risk for bleeding). High levels of creatinine indicate impaired kidney function. 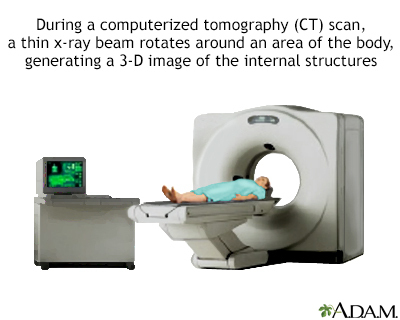 Ultrasound or computed tomography (CT) scan may be used to determine the extent of scarring in the liver and to check for signs of liver cancer. A newer imaging method called transient elastography measures liver stiffness and may provide a non-invasive alternative to liver biopsy. This technique is most often done using ultrasound. A score will be reported to reflect the severity of fibrosis thought to be present. The METAVIR score is widely used reporting five stages, F0 (no fibrosis) through F4 (cirrhosis). A liver biopsy is not always needed for diagnosis of cirrhosis. It may be performed for confirmation if other tests are inconclusive. A liver biopsy can also help determine the cause of cirrhosis, the extent of damage, and treatment options. 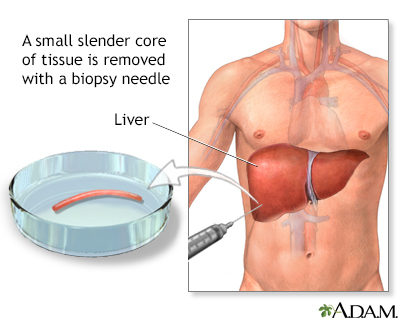 A biopsy involves a doctor inserting a thin biopsy needle, usually guided by ultrasound, to remove a small sample of liver tissue. Local anesthetic is used to numb the area. You may feel pressure and some dull pain. The procedure takes about 20 minutes. Uses a needle inserted through the skin over the liver area to obtain a tissue sample from the liver. Uses a catheter (a thin tube) that is inserted in the jugular vein in the neck and threaded through the hepatic vein (which leads to the liver). A needle is passed through the tube, and a suction device collects liver samples. Is a procedure in which the doctor makes a small abdominal incision and inserts a thin tube that contains a tiny camera to view the surface of the liver. The doctor can place small surgical instruments through the tube to take a tissue sample. May be used to check for esophageal varices. In this test, a fiber-optic tube is inserted down the throat. The tube contains a tiny camera to view the inside of the esophagus, where varices are most likely to develop. Is performed to determine the cause of ascites. This procedure involves using a thin needle to withdraw fluid from the abdomen. Your doctor may recommend you have regular screening tests to check for the development of liver cancer (hepatocellular carcinoma). These tests include a blood test to check for levels of alpha-fetoprotein and an imaging test (ultrasound, MRI, or CT scan). If caught early enough, the early stages of liver scarring (fibrosis) can sometimes be treated to reduce inflammation and prevent the development of cirrhosis. Once cirrhosis occurs, it is generally considered an irreversible condition. Treatment goals are to slow the progression of liver damage and reduce the risk of further complications. There are currently no drugs available to treat severe liver scarring, although researchers are investigating various anti-fibrotic drugs. It is very important for people with cirrhosis to completely abstain from alcohol. Sodium (salt) can increase fluid buildup in the body. Follow a low-sodium diet with plenty of fresh vegetables and fruits and avoid eating processed foods. People with cirrhosis are usually malnourished and require increased calories and nutrients. Your doctor may suggest you take a vitamin supplement. Vaccinations (such as hepatitis A, hepatitis B, influenza, pneumococcal pneumonia) are important. Ask your doctor which vaccinations you need. Discuss all medications with your doctor. Before you take any medications, ask your doctor if they are safe for you. Liver damage affects the metabolism of drugs. Opioids, sedatives, anti-anxiety drugs, and proton pump inhibitors can trigger serious complications. Nonsteroidal anti-inflammatory drugs (NSAIDs) such as aspirin, ibuprofen, and naproxen should not be used because they can trigger bleeding, worsen cirrhosis, and potentially cause kidney failure. In recommended doses, acetaminophen (Tylenol, generic) is a safer choice for pain management. Inform your doctor of any herbs or supplements you are considering taking. Certain types of herbal remedies (kava, chaparral, kombucha mushroom, mistletoe, pennyroyal, and some traditional Chinese herbs) can increase the risk for liver damage. Although some herbs, such as milk thistle (silymarin) have been studied for possible beneficial effects on liver disease, there is no scientific evidence that they can help. Treatment for cirrhosis depends on the cause of cirrhosis. In some cases, treatment of an underlying condition may help reverse early-stage cirrhosis. Many types of antiviral drugs are used to treat chronic hepatitis B. Treatment for chronic hepatitis C depends on the genotype. Treatment options for hepatitis C are constantly evolving as new drugs are approved. Successful treatment of hepatitis can sometimes lead to regression of cirrhosis. Autoimmune hepatitis is treated with the corticosteroid prednisone and also sometimes immunosuppressants, such as azathioprine (Imuran). Ursodeoxycholic acid (Actigall, generic), also known as ursodiol or UDCA, is used for treating primary biliary cirrhosis but does not slow the progression. Itching is usually controlled with drugs such as cholestyramine (Questran, generic) and colestipol (Colestid). Antibiotics for infections in the bile ducts and drugs that affect the immune system (prednisone, azathioprine, cyclosporine, and methotrexate) may also be used. Surgery may be needed to open up the bile ducts. Weight reduction through diet and exercise, and diabetes and cholesterol management are the primary approaches to treating these diseases. Hemochromatosis is treated with phlebotomy, a procedure that involves removing about a pint of blood once or twice a week until iron levels are normal. Dietary salt restriction (generally less than 1,500 mg/day of sodium). Drug treatment with diuretics. A combination of spironolactone and furosemide is used. Your doctor must be careful to avoid doses that remove fluid too rapidly. Discontinuing all nonsteroidal anti-inflammatory drugs (NSAIDs). Other drugs that may be harmful for patients with ascites are certain blood pressure medications, including ACE inhibitors and angiotensin receptor blockers (ARBs). Fluid restriction is usually not necessary unless sodium levels in the blood are low. Liver transplantation may be considered. Large-volume paracentesis, which involves using a thin needle to withdraw fluid from the abdomen, may be used for ascites refractory to medical treatment or when complications are present. This may have to be repeated. Transjugular intrahepatic portosystemic shunt (TIPS) uses a stent placed in veins in the middle of the liver to keep open a passage connecting the hepatic and portal veins. This helps reroute blood around the scarred liver. In the procedure, a long needle is inserted into the jugular vein in the neck and passed down to the hepatic and portal veins. Alternatively, a peritoneovenous shunt may be used. People with ascites who have high white blood cell counts should receive intravenous or oral antibiotic therapy. People who have had an episode of spontaneous bacterial peritonitis are usually treated with long-term antibiotic therapy to prevent further infection, but doctors must also consider the risk for drug resistance. Hepatorenal syndrome can occur in patients with ascites. This is a life-threatening condition in which kidney failure develops because of altered blood flow in the liver. People with hepatorenal syndrome are usually treated with intravenous infusion of albumin or with the drug pentoxifylline. Protein-restricted diets used to be recommended to lower ammonia production. However, extreme protein restriction can cause malnutrition and be harmful. Guidelines now recommend that people receive adequate protein intake and have small meals throughout the day including a late-night snack of complex carbohydrate. Diets rich in vegetables and fiber are also important. The laxative lactulose, given as a syrup or enema, is used to empty the bowels and to help improve mental status. The antibiotic rifaxmin (Xifaxan) may be added for people who do not improve with lactulose alone. Sedatives and medications containing ammonium (such as certain antacids) should be avoided. Other therapies may also be recommended. People who are hospitalized for hepatitis-related encephalopathy may need intravenous or tube feedings or require a shunt procedure. Primary prevention means treating the varices before they have bled. Varices that are present in the esophagus, stomach, or intestines are always at risk of bleeding. Beta-blockers drugs, which are commonly used to treat high blood pressure, may be given to prevent bleeding. People with medium-to-large varices that have not bled may be treated with a surgical procedure called endoscopic variceal ligation (EVL). EVL is also called band ligation. It involves inserting an endoscope down through the esophagus. Latex bands are wrapped around the bleeding varices to shut off the blood supply. When varices located in the digestive tract begin to bleed (variceal hemorrhage), it is considered an emergency situation. The first step is to immediately achieve normal blood clotting (hemostasis) in order to stop the current bleeding episode. Blood transfusions are usually required. The main treatment for variceal hemorrhage is a drug that tightens blood vessels (vasoconstrictor) such as ocreotide (Sandostatin, generic). Medical procedures to stop bleeding include endoscopic variceal ligation (described above). An alternative procedure is endoscopic sclerotherapy. In endoscopic sclerotherapy, the endoscopic tube is inserted through the mouth and a sclerosant (a solution that toughens the tissue around the variceal blood vessels) is injected to stop the bleeding. If these treatments do not control the bleeding, or bleeding recurs, a transjugular intrahepatic portosystemic shunt (TIPS) procedure is performed. (For more information on TIPS, see "Treatment of Ascites" above.) However, this procedure can increase the risk for encephalopathy. Another procedure, called balloon tamponade, may be used to temporarily control bleeding prior to the TIPS procedure. Balloon tamponade is performed only for bleeding that cannot be controlled by drugs or endoscopy. It involves inserting a tube through the nose and down through the esophagus until it reaches the upper part of the stomach. A balloon at the tube's end is inflated and positioned tightly against the esophageal wall. It is usually deflated in about 24 hours. Balloon tamponade poses a risk for serious complications, the most dangerous being rupture of the esophagus. People who survive an episode of variceal bleeding need to be treated with drugs to prevent bleeding recurrence. They are prescribed either a combination of a nitrate drug and a beta-blocker or a beta-blocker alone. Several sessions of endoscopic variceal ligation may also be performed over the course of several months. The TIPS procedure may be recommended if bleeding recurs despite drug and endoscopic therapy. Liver transplantation may also be an option. Septic shock is a life-threatening condition that occurs when severe bacterial infection causes extreme low blood pressure. It is very important that people with cirrhosis and septic shock receive immediate and appropriate antibiotic treatment. When cirrhosis progresses to end-stage liver disease, liver transplantation may be an option. Transplantation is not necessary or appropriate for all people with cirrhosis. A scoring system called Model for End-Stage Liver Disease (MELD) is used to determine which patients are most in need of a donor liver. A MELD score predicts 3-month survival based on laboratory tests of creatinine, bilirubin, and blood-clotting time. Priority is given to people who are most likely to die without a liver transplant. Unfortunately, there are many more patients waiting for liver transplants than there are available organs. Living-donor liver transplantation is an option. In living-donor transplantation, surgeons replace the person's diseased liver with a part of the liver taken from a donor. The donor's liver regenerates to full size within a few weeks of surgery, and the recipient's liver also regrows. This procedure produces excellent results, but there are some risks for the donor. Transplantation surgery generally takes 4 to 12 hours to perform, and patients stay in the hospital for up to 3 weeks after the surgery. Most people return to normal or near-normal activities 6 to 12 months following the transplant. For the rest of their lives, they will need to take immunosuppressive medication to prevent rejection. Current 5-year survival rates after liver transplantation are about 80%, depending on various factors. People report improved quality of life and mental functioning after liver transplantation. In researching transplant centers, ask how many transplants they perform each year and their survival rates. Compare those numbers to those of other transplant centers. One of the primary problems with performing liver transplantation in patients with viral hepatitis is recurrence of the virus after transplantation. Recurrence occurs more often with hepatitis C than hepatitis B. Pretreatment with antiviral drugs, along with life-long immune globulin injections after transplant, is very successful in reducing the risk of recurrence in hepatitis B. Pretreatment with new drugs such as sofosbuvir is showing promise in preventing recurrence in hepatitis C.
Liver transplantation is controversial for people with alcoholic liver disease. Most transplant centers recommend that people achieve at least 6 months of sobriety before being considered for a transplant. People with alcohol dependence who may need a liver transplant should meet with a mental health professional for evaluation of psychological problems, and to get help setting goals for addiction treatment. Click the icon to see an illustrated series detailing a liver transplant. Amodio P, Bemeur C, Butterworth R, et al. The nutritional management of hepatic encephalopathy in patients with cirrhosis: International Society for Hepatic Encephalopathy and Nitrogen Metabolism Consensus. Hepatology. 2013;58(1):325-336. PMID: 23471642. www.ncbi.nlm.nih.gov/pubmed/23471642. Carey EJ, Ali AH, Lindor KD. Primary biliary cirrhosis. Lancet. 2015;386(10003):1565-1575. PMID: 26364546 www.ncbi.nlm.nih.gov/pubmed/26364546. Carrion AF, Martin P. Liver Transplantation. In: Feldman M, Friedman LS, Brandt LJ, eds. Sleisenger and Fordtran's Gastrointestinal and Liver Disease. 10th ed. Philadelphia, PA: Elsevier Saunders; 2016:chap 97. Frulio N, Trillaud H. Ultrasound elastography in liver. Diagn Interv Imaging. 2013;94(5):515-534. PMID: 23623211 www.ncbi.nlm.nih.gov/pubmed/23623211. Ge PS, Runyon BA. Treatment of Patients with Cirrhosis. N Engl J Med. 2016;375(8):767-777. PMID: 27557303www.ncbi.nlm.nih.gov/pubmed/27557303. Lewis JH, Stine JG. Review article: prescribing medications in patients with cirrhosis - a practical guide. Aliment Pharmacol Ther. 2013;37(12):1132-1156. PMID: 23638982 www.ncbi.nlm.nih.gov/pubmed/23638982. Martin P, DiMartini A, Feng S, Brown R Jr, Fallon M. Evaluation for liver transplantation in adults: 2013 practice guideline by the American Association for the Study of Liver Diseases and the American Society of Transplantation. Hepatology. 2014;59(3):1144-1165. PMID 24716201 www.ncbi.nlm.nih.gov/pubmed/24716201. Pavlov CS, Casazza G, Semenistaia M, et al. Ultrasonography for diagnosis of alcoholic cirrhosis in people with alcoholic liver disease. Cochrane Database Syst Rev. 2016;3:CD011602. PMID: 26934429 www.ncbi.nlm.nih.gov/pubmed/26934429. Rinella ME. Nonalcoholic fatty liver disease: a systematic review. JAMA. 2015;313(22):2263-2273. PMID: 26057287 www.ncbi.nlm.nih.gov/pubmed/26057287. Runyon BA; AASLD. Introduction to the revised American Association for the Study of Liver Diseases Practice Guideline management of adult patients with ascites due to cirrhosis 2012. Hepatology. 2013;57(4):1651-1653. PMID: 23463403 www.ncbi.nlm.nih.gov/pubmed/23463403. Runyon, BA. Ascites and Spontaneous Bacterial Peritonitis. In: Feldman M, Friedman LS, Brandt LJ, eds. Sleisenger and Fordtran's Gastrointestinal and Liver Disease. 10th ed. Philadelphia, PA: Elsevier Saunders; 2016:chap 93. Tsochatzis EA, Bosch J, Burroughs AK. Liver cirrhosis. Lancet. 2014;383(9930):1749-1761. PMID 24480518 www.ncbi.nlm.nih.gov/pubmed/24480518.